I see many conversations about leading indicators. People searching for a leading indicator, or arguing whether an indicator is leading or lagging. This article provides a simple way of breaking through this problem. The whole debate about whether an indicator is leading or lagging is one of perspective. Not (simply) perspective in the balanced scorecard /strategy map sense, but in the sense of who is looking at it. You have to ask “For whom?” or “From whose perspective?” otherwise the conversation is meaningless. 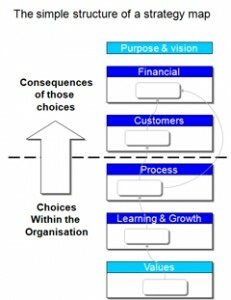 Perspectives of a balanced scorecard arranged as a simple cause and effect model. The classic example of a leading or lagging indicator is that across the perspectives of a balanced scorecard. The idea of leading and lagging indicators that Kaplan and Norton popularised is that the leading indicators of one perspective lie in the perspective BELOW the one you are looking at. Some will argue that the lagging indicators are seen as those that are outside the organisation, for instance those that are indicators of the customers meeting their needs or financial results. The leading indicators are those in the organisation. This is very simplistic. Treating leading and lagging indicators as merely in organisation and outside the organisation is simplistic because most organisations would look at their own productivity statistics and measures (in the process perspective) and say they were looking for indicators that their own performance will be improving. In other words they are looking for leading indicators below the process perspective. This means they are typically looking for leading indicators in the balanced scorecard’s learning and growth perspective. In reality, you can do leading and lagging indicators along a perspective. For instance sales enquiries is a leading indicator of potential sales. Whether an indicator is leading or lagging for you, all depends where you are sitting: In the organisation as a whole, in sales, in production, in finance, in HR. For instance, sales created (signed contracts) is a lag indicator for the sales team who might treat the number of leads, client visits and proposals as leading indicators. Signed contracts for sales is a lead indicator for finance as no money has come in yet. The revenue has not being realised. So what is a leading indicator for some one part of the organisation can be a lag for another. And vice versa. The picture below shows how the basic cause and effect model sits alongside the basic scorecard that contains the measures. So you develop the objectives in each perspective and the cause and effect relationship between them. Then you look for measures and indicators of each objective. This gives you measures in each perspective that should monitor the deliver of the strategy’s cause and effect model. Strategy map with cause and effect model, alongside the scorecard that holds the measures and initiatives. 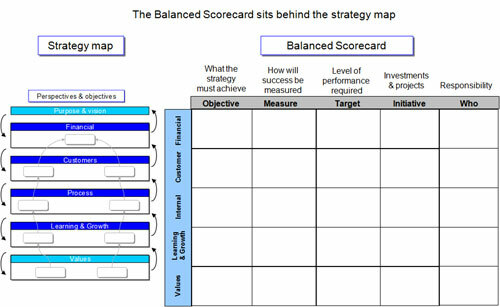 Remember that you create a balanced scorecard and strategy map, not for an organisation, but for a management team, and a set of strategy maps and scorecards for an organisation. Again this makes things clearer, as leading indicators lower down the organisation can be precursors to impact further up the organisation. What matters is from that management team’s perspective. For instance completion of a IT project, say, is a lag indicator of success for the project team and a lead indicator of success for those responsible for realising the benefits. Finally, of course, there is the relationship across the business model represented by the perspectives of the strategy map/scorecard cause and effect model: if I improve our capability or culture, it will improve our processes so our customers will be happier and give us more money. So it is all a matter of perspective and any discussion of lead or lag has to take this into account. Most of the problem in these discussions is that, by default, a poorly defined “corporate” view is being taken. But which one, the Sales Director, the Finance Director, the accruals, the year end accounts, or the shareholders? So, in answer to the question , “What leading indicator should I use?” the answer is simple. It depends who “I” is. It also depends what you are trying to achieve. IA client was really struggling with leading indicators. To help them understand what they were trying to do I provided an explanation of ten different types of leading indicator. Have a read, I am sure it will help you as well. If you want to unlock your performance (and get a grip on whether you are making progress), then give us a call.